Erica Bunker | DIY Style! The Art of Cultivating a Stylish Wardrobe: Review: Simplicity 1158 | The Printed Jumpsuit! 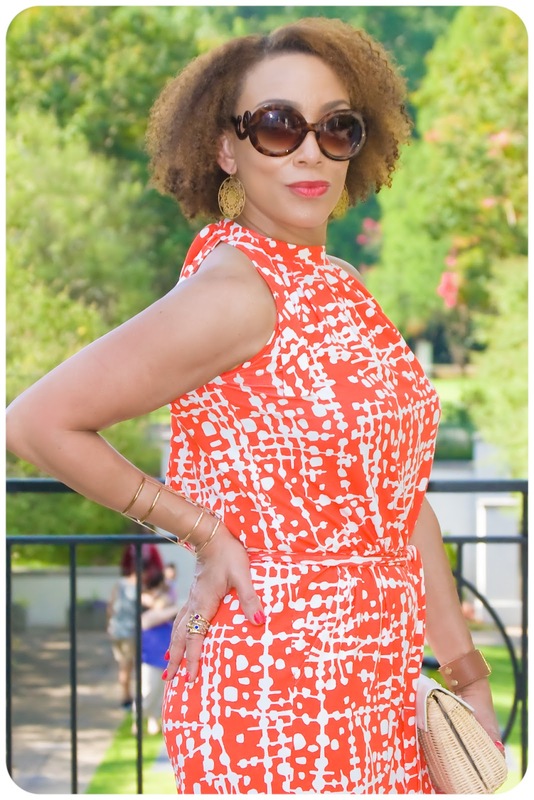 Review: Simplicity 1158 | The Printed Jumpsuit! I love jumpsuits, that's no secret. But as of late, I've been adding color to my wardrobe. And this gorgeous Poppy Abstract Stretch Viscose Jersey from Mood Fabrics.com screamed to me to become a printed jumpsuit. For my jumpsuit, I used Simplicity 1158, view B. I cut the size 12. I lengthened the bodice by an inch. And I lengthened the inseam by 5". When wearing heels, I like a 36" inseam. The Simplicity instructions were perfect. I have no complaints. 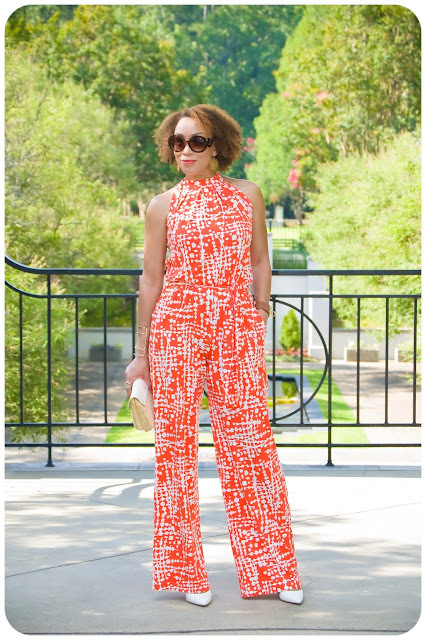 The construction and style is very similar to a RTW jumpsuit. But the only thing I found that I needed to adjust was the armhole. Mine was a little too low, with my bra peeking out and I had a little bit of gaping. I took mine in. The neck tie is pretty much lost in the print, but it is a cute detail. And the wrap effect back is perfectly drafted to keep my strapless bra appropriately covered. This is a great pattern which produces a garment that is both appropriate for day or night. I love the elongating wide-leg silhouette. I went back and forth with myself on whether or not to make the self-belt or to add a RTW belt. I went with the sash. It's great and waist defining. And since it's not attached to the jumpsuit, a RTW belt can always be substituted. Sewing Tip! Even though this is a jersey garment, I still interfaced my 1.25" hem. It gives the hem weight and ensures that the garment will hang properly to the ground. Style tip: With a garment as heavily printed as this one and with a high neck to boot, there really is no point of a necklace. It would just get lost in the print. I accessorized with large filigree gold earrings and bold bracelets. I carried my current favorite summer wicker pineapple clutch and punctuated with a white pump. Wow, that this is out of the ball park and into the streets, Erica. Gonna look great with your white jacket. Btw, how did you determine armholes were too low? A muslin? Now, you're gonna cause a run on this fabric if it isn't already sold out! I put it on and they were too low! LOL. Thanks Mary Beth! Love, love it. Great style and fit. I LOVE that print!! And the jumpsuit looks fantastic on you! Love it! Going to give it a try! :-) thanks for sharing. Erica, you look absolutely Fabulous!!!!!! 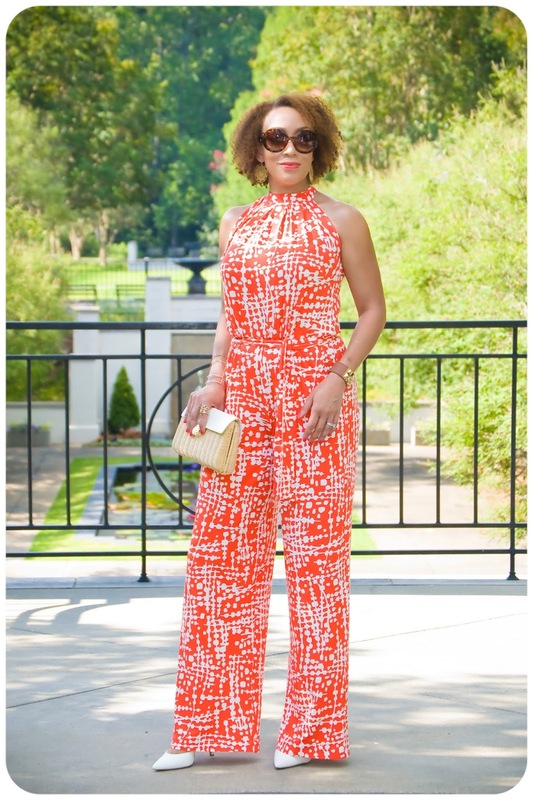 I love everything about this jumpsuit. This look screams Fabulously Chic!!! Gorgeous and I just bought that fabric. This fabric is incredible! Thanks Lori! I love this Erica! It's so effortlessly fabulous and fun! That fabric is gorgeous! Ugh, the armhole is a pain point. I've found it's almost always too low, but that's a fix you can make before you even cut out your fabric. Once you know where you want your armhole to start, measure from there, to your waist. Then compare that measurement to your pattern piece and adjust before you even cut into your fabric. Gorgeous fabric. Love this jumpsuit pattern! Oh I love it. Love. It. Now, that a a cute jumpsuit. I love the the print and you are rocking it! Great Job as always! Love it! What weight of interfacing are you using for your hems (especially for knits)? Do you change it depending on the fabric? Thanks for the tips/tricks. I enjoy seeing your creations! I use French Fuse which works perfectly with lightweight to medium weight fabrics and it also has a small amount of stretch. Thanks JL! Hi Erica, gorgeous jumpsuit.. Very stylish as always. Thanks for the style & sewing tips. Great addition to your blog post and hope there will be many more. Purchased this pattern today...and the rayon Jersey...starting tomorrow after your gorgeous version!!! Stunning as always Erica! Thanks Deb and good luck with yours! I was at the Mood store in NYC and found this same fabric - woohoo! I purchased enough to make a simple little top out of it. I wrote a blog post about it because I love it. Thanks for the inspiration! I don't. I add length to the rise and to the bodice. Thanks Ann. Review: McCall's 7203 | Back-to-Black Jumpsuit! Keeping it Cool and Colorful! 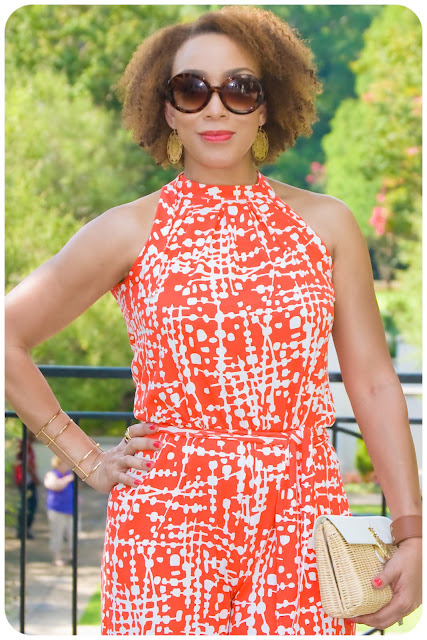 Review: New Look 6290 | Tailored Printed Shorts! Review: New Look 6271 | Printed Shorts!